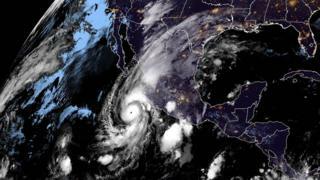 Mexico has issued an alert for parts of its Pacific seaboard as it prepares for the “life-threatening” Hurricane Willa. Willa is expected to make landfall on Mexico’s south-western coast on Tuesday and is “potentially catastrophic”, the National Hurricane Center (NHC) warned. Currently a Category Four – out of five – storm, it threatens to bring torrential rains and major flooding. “This rainfall will cause life-threatening flash flooding and landslides,” it added. The NHC said “an extremely dangerous storm surge” was also likely to affect coastal areas by Tuesday evening, adding that rain and strong winds would be accompanied by “large destructive waves”. Hurricane Michael, which made landfall on 10 October, was the most powerful ever to hit north-west Florida, also bringing winds of 250km/h. Residents of Mexico Beach, one of the worst areas affected, described the aftermath as a “war zone”.